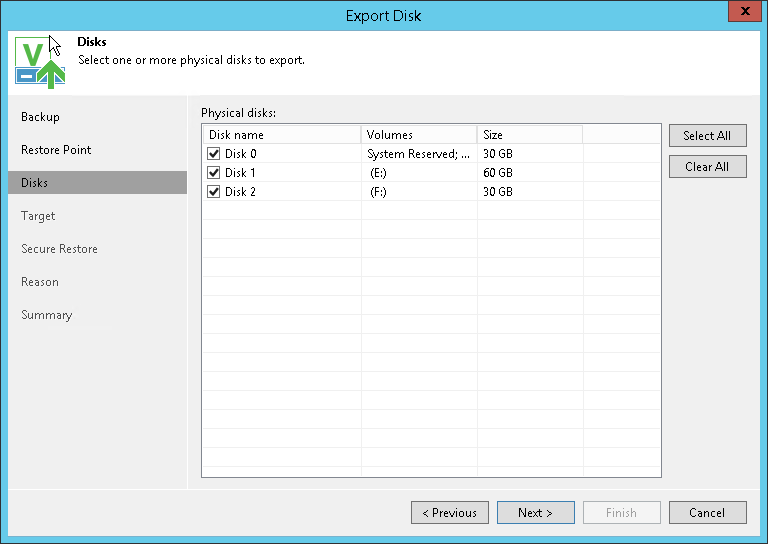 You can export computer disks included in volume-level Veeam Agent backups as virtual disks. The resulting virtual disks can be attached to a virtual machine. Thus, you can recover subtenant data that was originally stored on a physical device to the virtual environment. 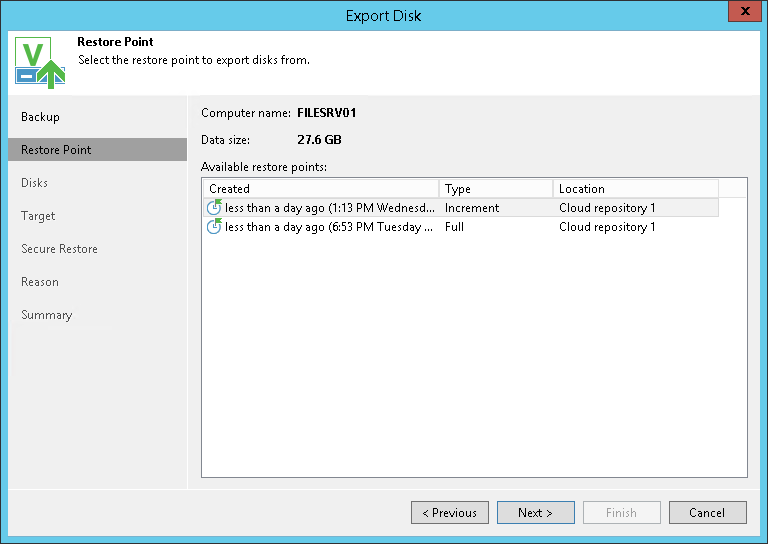 This section describes only basic steps that you must take to export disks contained in a Veeam Agent backup. To get a detailed description of all settings of the export process, see the Exporting Disks section in Veeam Agent for Microsoft Windows User Guide. Select the Backups node in the inventory pane. Expand the Agents node in the working area, right-click the necessary Veeam Agent backup and select Export disk contents as virtual disks. At the Restore Point step of the wizard, select the necessary restore point. At the Disks step of the wizard, select check boxes next to the disks that you want to export. VHD — select this option if you want to save the resulting virtual disk in the Microsoft Hyper-V VHD format. 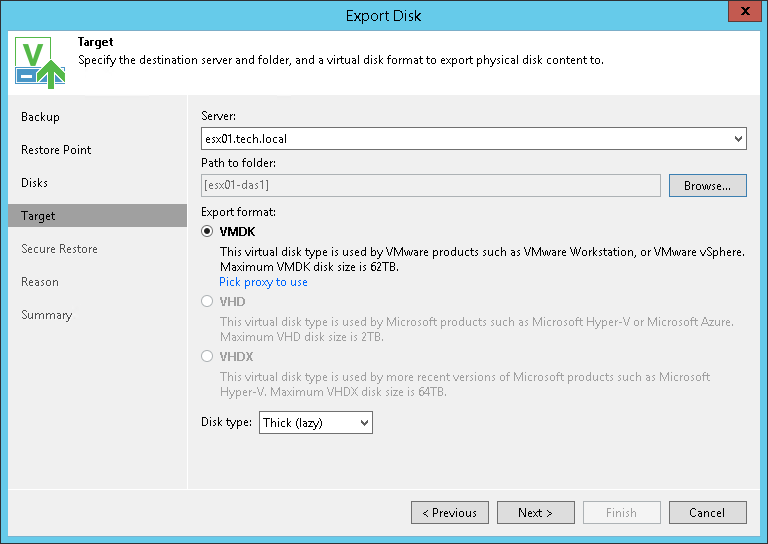 VHDX — select this option if you want to save the resulting virtual disk in the Microsoft Hyper-V VHDX format (supported by Microsoft Windows Server 2012 and later). [For VMDK disk format] Click Disk Type to specify how the resulting disk must be saved: in the thin provisioned or thick provisioned format. [For export of a VMDK disk to an ESX(i) host] Click the Pick proxy to use link to select backup proxies over which backup data must be transported to the target datastore. At the Reason step of the wizard, specify the reason for future reference. At the Summary step of the wizard, click Finish.